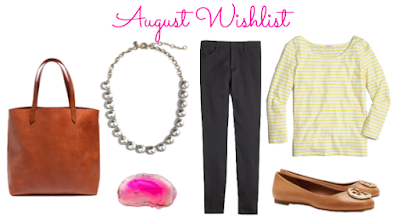 Today I thought I would share some of the things that are on my wish list for August! A lot of this stuff would be great for back to school and I would love to wear to school. I picked some simple clothes and accessories that can be paired in lots of different ways for school. I obviously won't be buying all these things this month, but it is very fun to share the things that I am loving! I'm dying for the pink hair barrette, as someone that doesn't do much different styling my hair I think it would be a fun way to style my hair! That barrette is super cute! I love all your picks. I know right?!? I love the barrette! There are so many cute things in stores right now and it is so hard to resist!